there is no bull in toro and we do not do bull runs. 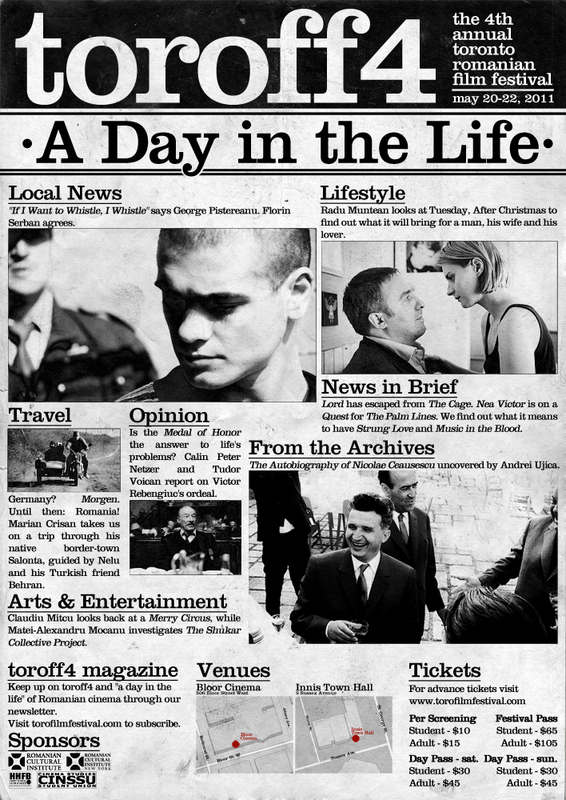 toro arts group showcases and nurtures art… do the toro! We will open with a selection of nominated and award winning shorts from the 2011 edition of the Filmul de Piatra – Stone Film Festival in Piatra Neamt, Romania. Once night falls (expected to be around 8:45) we will rejoin at the Hart House courtyard for, weather permitting, an outdoor screening of “Kino Caravan” (2010), directed by Titus Munteanu and starring Dorian Boguta and Ioana Lumanare. 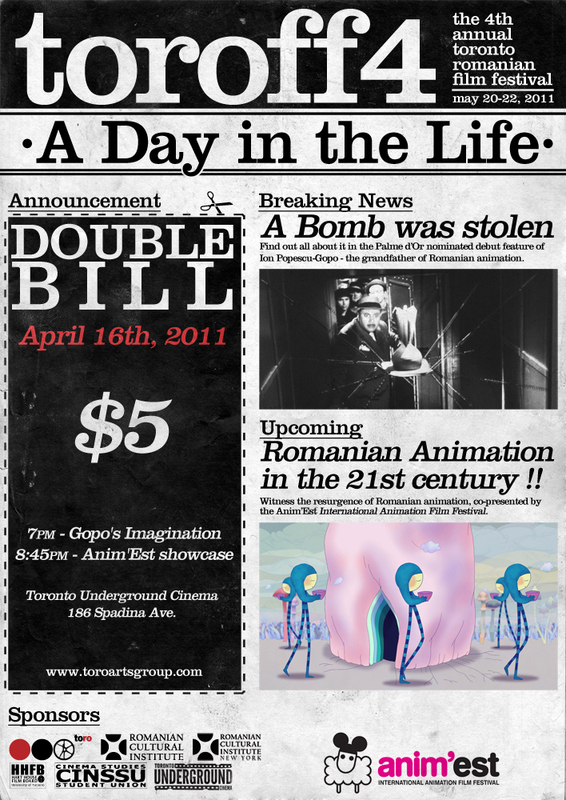 This year marks the 4th edition of the Toronto-Romanian Film Festival, which will be running from May 20th to the 22nd and will showcase ‘A Day in the Life’ of Romanian society. Every newspaper has a comic strip section, so we believe it to be fitting that as we near the 4th edition of the Toronto-Romanian Film Festival we take a look at Romanian animation. “Lumea vazuta de Ion B.”, filmul documentar produs de HBO Romania si Alexander Nanau Production si difuzat la „HotDocs“ – Toronto. 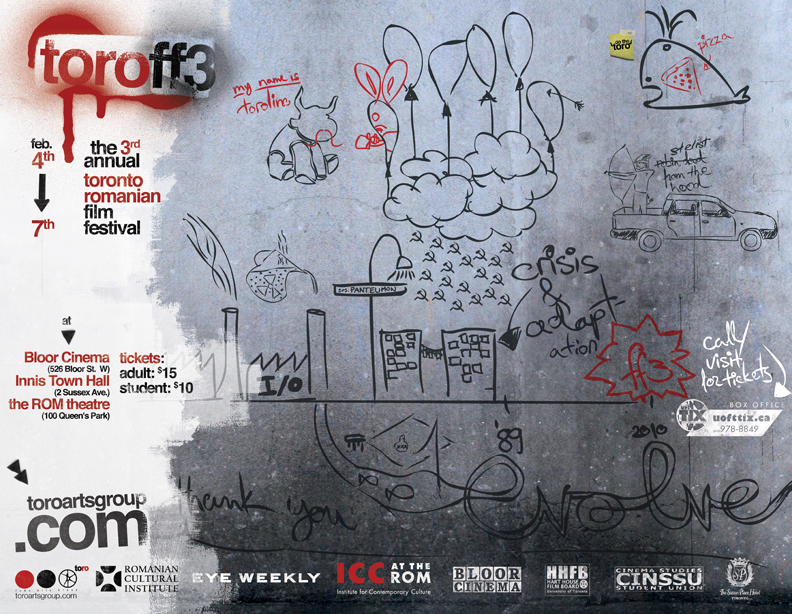 Scheduled to transpire between February 4th and 7th and curated by the ToRo Arts Group (with the support of, and in collaboration with, the Romanian Cultural Institute), the Third Annual Toronto-Romanian Film Festivalwill explore the intricacies, modes and relational realities of adaptation, as they manifest themselves socially, politically and economically.